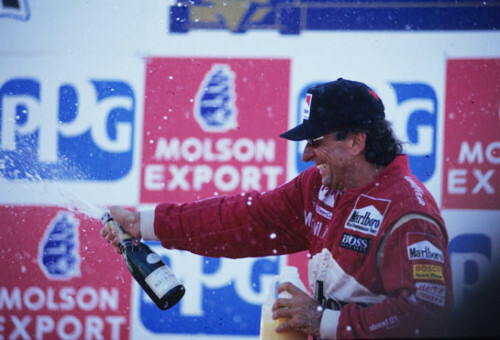 Back in 1987 I wrote a book with Emerson Fittipaldi titled 'The Art of Motor Racing'. This week I've adapted some of that book into the following column wherein Emerson provides his philosophy and approach to racing as well as offering some valuable advice to aspiring young racers on how to go about their chosen sport. Over the years, we wrote, many young guys have asked how they can become a top racing driver. That is a very tough question to answer because motor racing is a very difficult sport in which to succeed. It is a fantastic sport, full of magnificent sensations--controlling and sliding a car at high speed on the limit and competing against other cars and drivers. I think it is one of the most artistic of all sports. It requires that you take everything out of the car and yourself. It requires you to give the maximum of your intelligence and your feelings. These are the things that make motor racing an art and a great sport for a young man or woman to enjoy. It can also be a very rewarding career. But a young person tackling the sport professionally must be aware that it is extremely difficult to make it to the top in motor racing. To any young kid who asks me about going racing I always repeat what my good friend Mario Andretti says. If you don't take risks, you will never be a champion. Mario is one hundred percent correct in stressing this. There are risks in motor racing both on and off the track, and for anyone who wants to make a career out of it perhaps the toughest risks are going to be taken off the racetrack. I also say that when you start in go-karts or Formula Fords you cannot consider it a profession. You must look at the fact that a thousand people have failed for every one who has succeeded in this profession. Anyone who has dedicated himself to the sport and doesn't succeed is going to be frustrated for the rest of his life. If their mind is set one hundred percent on being a racing driver and nothing else, he could find himself in big trouble. After spending your teen-aged years and twenties focusing one hundred percent on racing to the exclusion of everything else you could find yourself a very frustrated and unhappy thirty year old. So I say race go-karts and do it well, but enjoy it for what it is. Enjoy the pleasures of racing a kart and racing against other people. But you must stay in school, become academically qualified, and learn a little about the world. Don't put a lot of pressure on yourself. Enjoy racing as a sport and enjoy all that life has to offer. Once you decide you want to be a professional driver you must dedicate yourself totally to the job. You will surely have to sacrifice, take risks, beg, borrow and move mountains just to earn the chance and sponsorship to show your talents. You will always have to fight to stay at the level you have achieved or to continue moving up the ladder. At the beginning, in particular, it takes a great deal of work to succeed, and there will always be a price you have to pay. Driving a racing car is not enough. Driving is something you must do as a sportsman, but it has nothing to do with finding sponsorship, and in motor racing everyone always asks the same question. Where can I get a sponsor? From the bottom of the ladder in go-karts to the top in Formula One you still have the same problem. How much money or sponsorship can you find for yourself and your team? If you call Frank Williams today and ask him how he's looking for the next Formula One season, he'll tell you he's looking for more sponsorship. If you call Roger Penske, you'll get the same answer. The plain fact is that motor racing is one of the most expensive sports in the world and you always need money and sponsors. There is a link for sure between how much money you put into the engine's intake system and how much performance comes out the exhaust pipe. It doesn't matter what level of racing you are at, the key to success is being able to achieve the level of sponsorship needed to win. If you can't do that, you will not win. At the beginning of your career it is very important to utilize any advantage you might have. Keep an eye out for any connection to the right sponsor or team. Work hard at it. Try anything and everything and then try again. In the second race of my life I drove a Renault sedan that a friend lent me. I didn't have a car to drive and my friend thought I could do well from what he'd seen me do in karts. He took a risk. He certainly wasn't going to make any money. He just wanted to see his car do well. Once the race got going I began dicing for the lead. I was using the brakes very hard and on one lap I pushed hard on the brake pedal and it went straight to the floor. I had to turn the steering wheel hard to try to avoid crashing into the barrier and the car rolled. It was completely destroyed. Both my friend and I had taken a risk and it looked like we had lost. But the next morning the local Renault dealer called to say he had been watching the race. He told me he was excited with the way I drove. He said he knew me from go-kart racing and said he would replace my friend's crashed car if I would sign a contract to drive for the Renault team. So my driving career in Brazil started in the right way. In my third race, I was fortunate to be driving for a factory team. The point is that it's not just the way you start your racing career. Timing and luck can be a big factor. Conversely, a guy can have tremendous natural ability--maybe a potential World Champion--but if he started in the wrong way, or at the wrong time, it's possible he may do only two or three races and never race again in his life. I think it's very important that when they're racing karts the young kids must learn how to work on their kart. You must learn at least the basics of the mechanics. A good foundation in the mechanics of the vehicle will always help you in one way or another in a racing career. The more you know about how and why the car works, the better off you will be. Some young drivers don't like to learn about the mechanics but it is an important and necessary part of racing. From the beginning in karts I learned the basics. Later, when I started racing a Formula Ford in England, I had no mechanic. I did the suspension setup and rebuilding of the engine myself. 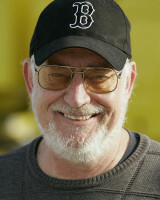 Denny Rowland, one the top Formula Ford engine builders at the time, used to stand over my shoulder and tell me what to do, but I did the work myself. I ran that car on my own, including changing the gear ratios at the track. I think that helped me a lot through my career because I could discuss with the mechanics and engineers exactly what was going on with the car. Many drivers have this same experience and knowledge, although there are some drivers who don't care to know much about the mechanical details. But I think no matter what category you compete in, if you know what is happening with the mechanical aspects of the car, it will always help. You will be able to locate problems faster than the guy who doesn't understand his car as well. It also helps you to finish races and communicate with your team, and it helps you go faster. If you are serious about being a racing driver, you must also lead a balanced life. You must have regular sleeping hours every day. It's perhaps okay to drink a moderate amount of wine or beer, but never take drugs or anything that is going to take away from your reflexes and coordination. This is vital to racing. It's basic. Like any sportsman, a racing driver must have restrictions on his life. Partying does affect your reflexes, coordination and concentration. Like a fighter pilot, for a racing driver to be at peak performance, your body must be rested and free of alcohol or drugs. A racing driver must have a rule of sleeping seven or eight hours--whatever is ideal for that person--and of eating the right food. Even at forty years of age, as I began my second career in racing as an Indy car driver, I found that there were still areas for improvement in my diet as well as in my physical and mental capabilities. So I got involved in a physical and psychological fitness program devised by Doctors Jacques Dallaire and Dan Marisi, who were working at the time at McGill University in Montreal. It was an interesting and beneficial program which gave me some excellent insights and methods for improving my physical fitness and mental approach. I think every driver who is able to race competitively is able to sense the notion of lines and apexes through the seat of his pants. When I was a kid, even before I drove a go-kart, I already had those ideas in mind. I remember watching Fangio drive one of his last races at Interlagos in 1957. I was eleven years old and very excited to see the great Fangio drive. I remember watching Fangio and being impressed with how he was driving the limit yet he was always consistent. 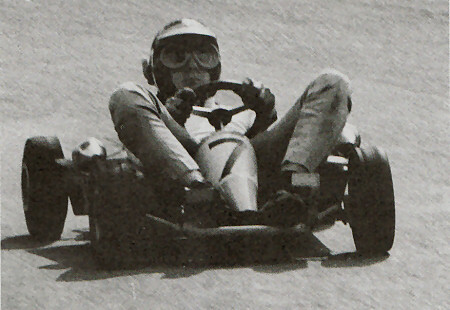 Every lap, he would put his inside wheel on the apex at exactly the same point. I remember quite clearly his precise lines and smooth, consistent technique. That was the way I wanted to drive. 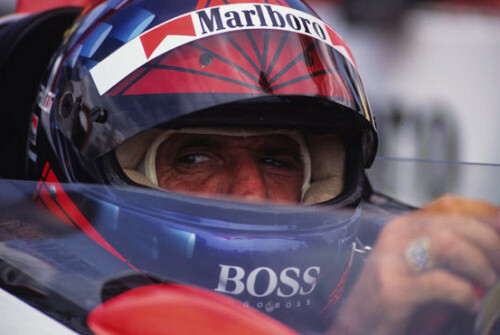 The technique of driving a modern Formula One or Indy car is much different from the technique of Fangio's day but the same rules always apply. These are the tenets of smoothness, precision and consistency. 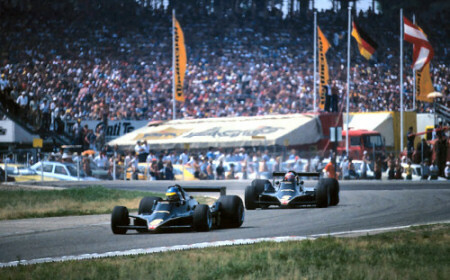 One of the greatest drivers during my time in Formula One was Ronnie Peterson, my teammate at Lotus in 1973. Ronnie was very much an artist. He was a very aggressive driver with totally exceptional abilities at sliding the car, what we call car control. Ronnie could be a smooth driver but when he wanted to drive really fast he would throw the car around even the fastest corners. 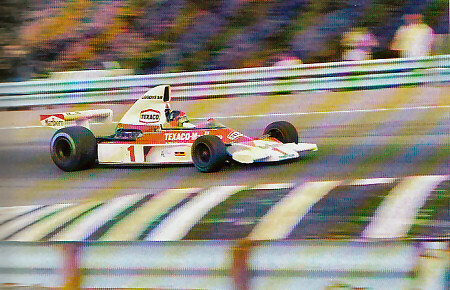 Ronnie remains one of the few drivers who could drive really fast that way. Jochen Rindt was another driver I saw in action who had the same rare ability as Ronnie. Keke Rosberg and Gilles Villeneuve were also very aggressive and very fast drivers, but beyond those few it's hard to find any successful, top-line driver who wasn't very smooth when he was achieving the maximum. The biggest transition in driving technique came in 1977-'79 when Colin Chapman started the ground-effect revolution in Formula One with the Lotus 78 and 79 Formula One cars. I would say that until unrestricted ground-effect cars with sliding skirts were banned in F1 in 1982 that period required a braver driver. Those were the days of sliding skirts which completely sealed the underbody at the road surface. Those cars had to be driven on rails because all the wings and fences and the underbody would lose a lot of downforce if the car was at an angle. The same rule applies to today's Formula One and Indy cars, but in those days it was even more critical to keep the car straight. Because of all the downforce and suction there was a lot of aerodynamic load on the car's front axle and the steering was very heavy. The cars generated so much downforce and had such phenomenally low pressure underneath that you could not feel or measure in any way when the car started to slide. When it would go, it would just be gone! For me, there was no pleasure in driving those cars. A driver could not sense the slip angles from the tires in those cars. That was one of the reasons why there was no warning from those cars. At one moment you would be fixed to the ground and at the next moment the car would be gone with no chance to recover. I hated driving the full ground-effect cars from that period. After sliding skirts were banned the cars were much better. They are not as sensitive to pitch change as the fully skirted cars were and they give the driver good information and feedback for him to react, even at cornering speeds faster than 200 mph. I have seen many drivers who are good on their own but have problems when it comes to racing. Every driver reacts differently. With some drivers you can drive wheel-to-wheel and know they are not going to do anything silly. But there are other drivers you don't feel comfortable with because you know the guy is going to change his line before the corner or lose his rhythm. A good driver under pressure will not change his line or speed. They can take the pressure. But some drivers can't take the pressure. You can tell when you're racing against a good driver because he continues to drive at the same speed, the same pace. He has the same coordination with you behind him as he does on his own. Perhaps the single most important factor in being competitive and successful in motor racing is motivation. I remember Bobby Rahal saying that motivation and perseverance are maybe more important than talent. That may sound extreme but I think anyone who has experienced motor racing from the inside would agree. Actually, I think this applies to being successful in almost every kind of sport, pursuit or business. I think the most important thing is you must enjoy driving a racing car fast and competing with other people. You must have a fantastic feeling when you approach a corner at very high speeds. That's when you have the maximum motivation for driving a racing car fast. You must have a good feeling and be happy with what you're doing. The moment you dislike any aspect, it doesn't matter what personal achievement you might have made, you are not going to perform as well as you should. The worst time in my racing career came in 1979 and '80 during the ground-effect era when I simply did not enjoy driving those cars. 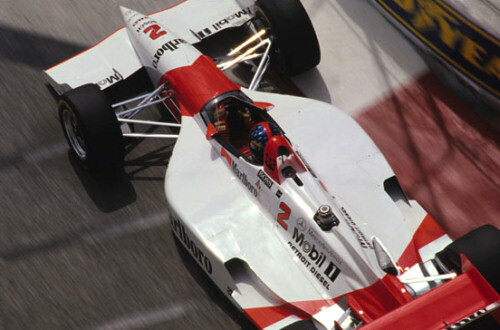 During that time the circumstances with our own Fittipaldi team were very bad with all the aggravation we had finding the money and building our own cars and living through the ground-effect era. It got to the point where I began to lose some of my enjoyment for racing and was not enjoying driving a racing car. My career in Formula One was very enjoyable and satisfying for seven or eight years. I won two World Championships and fourteen races. I drove for Lotus and McLaren, two of the top teams in the history of Grand Prix racing. Then during the 1975 F1 season, my brother Wilson and I decided to start our own team. We thought we could generate the excitement and interest in Brazil to support a Brazilian team, but it turned out to be a big mistake. We knew it would be tough to get the team going but we underestimated what it would take to build our own team. The first few years weren't really a big problem, even though the cars were bad. 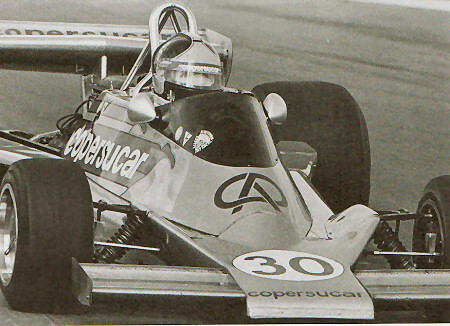 I had a good year in 1978, including finishing second in the Brazilian GP. The car was fast and I was enjoying driving. But in 1979 the car was a disaster and in 1980 it was only slightly better. Those two years were my last in Formula One and I did not enjoy myself at all. As I say, I hated driving the full-skirted ground-effect cars of that era and I was going to the races because it was an obligation. I had become too involved in the problem of trying to make our team work and had neglected my marriage and personal life. I made a mistake by getting too involved in too many things and as a result my personal and family life was neglected and damaged to the point where it defeated the way I was pursuing my sport. So I stopped. I retired from F1 and I have never regretted in any way doing that because there was no way I could continue. I remember leaving home with my helmet in hand, not at all happy that I was going to another race. If you are going to compete in a sport you must enjoy it. Otherwise, you will not have the motivation to meet the challenge. If you are not motivated to get the best from yourself, stay home. Watch the race on TV. A few years later, after a break from racing, I found a new challenge and a new motivation in Indy cars. It was a whole new world to learn about and I enjoyed it immensely. It was a different world from Formula One, but very challenging. I had a lot to learn about oval racing, which is much more difficult and demanding than some people imagine. The lessons of oval racing would fill a book in itself and I am proud that I was able to be successful in Indy cars at the height of CART's worldwide popularity. 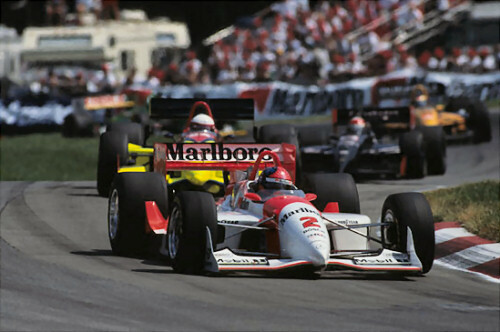 Those cars were very challenging to drive and there was plenty of serious competition from Mario, Nigel, Rick Mears, Bobby Rahal, Al Unser Jr, Michael Andretti, Danny Sullivan and many others, including some very quick newcomers like Jacques Villeneuve and Greg Moore. I had the pleasure to meet many great people during my time racing Indy cars and really enjoyed the atmosphere around racing in America. I treasure those years equally as well and in some ways more than my time in Formula One. If you are successful in motor racing you will probably find at some stage that you are traveling too much. You are on the road or in the air all the time, traveling to races, test sessions and promotional appearances. If you are away from home for a long time, you might suddenly realize your mind is not at the race or the test session. Everyone has their own taste for life, for sport and for their family and you must pull all that together in the correct way for you and your family. Motor racing can be like a drug. You can enjoy it so much that you find it very difficult to get away from. So it is important to realize there is another world out there. It is very easy to get so deeply involved in motor racing that you forget you are a human being, that should have a home, a family and friends away from racing. You must remember that it doesn't matter if you are a top racing driver. We are all the same. We are all human beings. People may look at a top racing driver as if he was a movie star or national hero, but just because a sportsman has certain abilities that they have put to good use doesn't mean they are any better than other people. Your feelings and emotions are the same as others. If you think the world revolves around you, sooner or later you will have problems. Many people in racing forget this. They live in their own world and feed entirely off the racing environment. Then they crash in life. I've been through the extremes. I know what I'm talking about. I can tell you when a driver retires he does miss the feeling for driving the car. You miss the ambience of the racetrack, the butterflies before the start and the question in everyone's mind about what is going to happen. All that excitement is like a drug. The faces just before the start of the mechanics, the team managers and the fans and people in the media. Who is going to win the race? What is going to happen in the championship? All those thoughts and emotions go through your body and when you stop racing you miss it, for sure. A final point regarding motivation and achieving a balanced life. When I came back to racing in 1984 some people said I was doing it for the money. All I can say is I would never get into a racing car just for the money. I don't think you would ever have the motivation to drive or race properly. Money is important and for sure a motivating factor in any profession or sport, but what is most important are the good feelings you have for the sport and for driving a racing car. Those are the right reasons for pursuing a career in motor racing.